It’s officially spring around here and I have been searching for something to help get my winter skin ready… I think this recipe is a FABULOUS way to give you the soft skin you want as we start wearing less layers each day. I looked at hundreds of recipes that called for so many wonderful-sounding ingredients, but it all came down to the idea that I wanted to find something easy to make (and remake) anytime I want. I hope you’ll find this recipe to be the easiest… and one that can be altered in a myriad of ways to suit anyone’s taste preference. I started with one cup of white sugar and one cup of brown sugar. To this, I blended in one quarter cup of coconut oil and one quarter cup of olive oil as well as one Tablespoon of lemon extract and one Tablespoon of white wine (I used a Chardonnay for this recipe). Once all the ingredients are mixed together in the bowl, use a whisk and thoroughly incorporate the ingredients until they resemble a very light and airy cookie dough. They will separate at a later point, but this is your scrub. Once the sugar scrub is light and thoroughly blended, spoon it into resealable containers. You can see that I chose one plastic jar and one glass jar for the photo – this is simply because I had both on hand. Use whatever you prefer or choose to use. This scrub will keep for a few weeks… it’s not necessary to refrigerate the scrub as the oils will solidify and have to be warmed up before use if you do so. I like to use this scrub on my feet and hands to keep both soft and smooth. Feel free to keep some by the kitchen sink to use after doing dishes or in the bathroom for use in the shower or at bedtime. It smells lovely and your hands & feet will appreciate the attention. This makes a wonderful and thoughtful gift for anyone on your list. 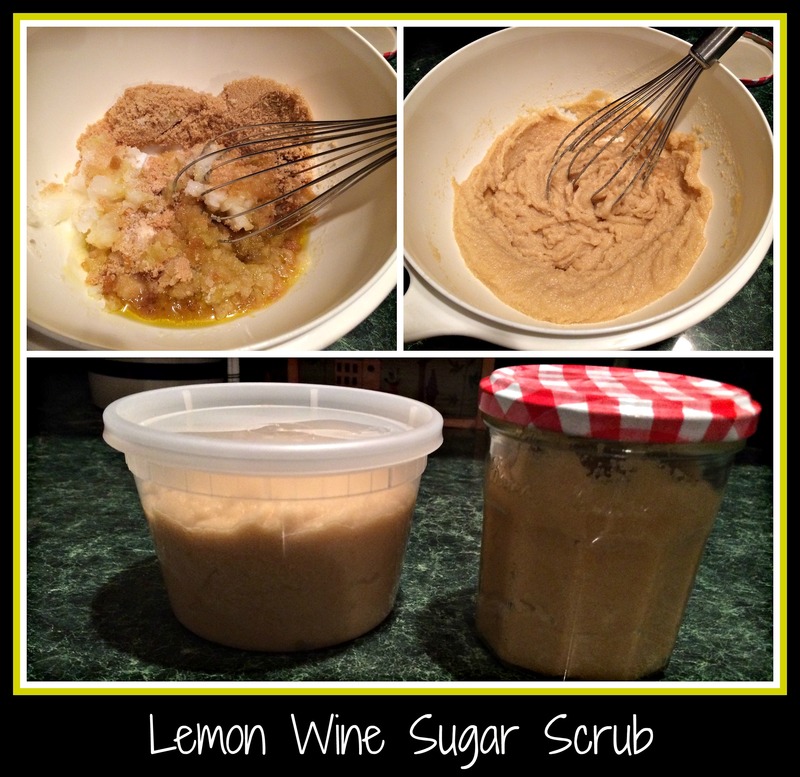 This entry was posted in Non-food recipe, white wine and tagged lemon, sugar scrub, white wine. I tried the red wine brown sugar scrub you made for Julie’s shower and LOVE it! It smells so good and made my skin feel so hydrated and smooth. Thank you so much for making it for all of us! Love and miss you!